I was having a lazy Saturday morning, flicking through the news on my i-pad at my favourite coffee shop in Telford. I find the most interesting bits are their commentaries on the British Housing Market. Some talk about property prices, whilst others discuss the younger people struggling to get a foot-hold on the property ladder with difficulties of saving up for the deposit. Others feature articles about the severe lack of new homes being built. A group of people that don’t often get any column inches however are those existing homeowners who can’t move! Back in the early 2000’s, between 1m and 1.3m people moved each year in England and Wales, peaking at 1,349,306 home-moves (i.e. house sales) in 2002. However, the ‘credit crunch’ hit in 2008 and the number of house sales fell to 624,994 in 2009. Since then this has steadily recovered, albeit to a more ‘respectable’ 899,708 properties by 2016. This means there are around 450,000 fewer house sales (house-moves) each year compared to the noughties. 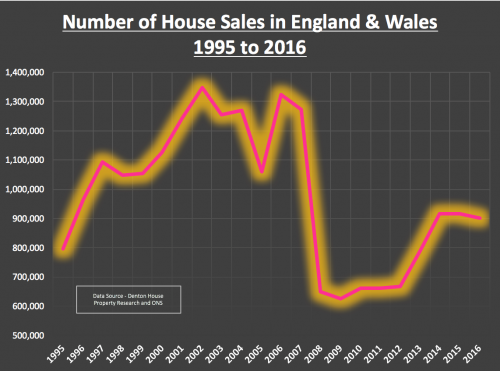 The question is … why are there fewer house sales? To answer that, we need to go back 50 years. Inflation was high in the late 1960’s, 70’s and early 80’s. To combat this, the Government raised interest rates to a high level in a bid to lower inflation. Higher interest rates meant the householders monthly mortgage payments were higher, meaning mortgages took a large proportion of the homeowner’s household budget. However, this wasn’t all bad news since inflation tends to erode mortgage debt in ‘real spending power terms’. Consequently, as wages grew (to keep up with inflation), this allowed home owners to get even bigger mortgages. At the same time their mortgage debt was decreasing, therefore allowing them to move up the property ladder quicker. Roll the clock on to the late 1990’s and the early Noughties, and things had changed. UK interest rates tumbled as UK inflation dropped. Lower interest rates and low inflation, especially in the five years 2000 to 2005, meant we saw double digit growth in the value of UK property. This inevitably meant all the home owner’s equity grew significantly, meaning people could continue to move up the property ladder (even without the effects of inflation). This snowball effect of significant numbers moving house continued into the mid noughties (2004 to 2007), as Banks and Building Society’s slackened their lending criteria. [You will probably remember the 125% loan to value Northern Rock Mortgages that could be obtained with just a note from your Mum!!]. This meant home movers could borrow even more to move up the property ladder. So, now it’s 2017 and things have changed yet again! What does this translate to in pure numbers locally? 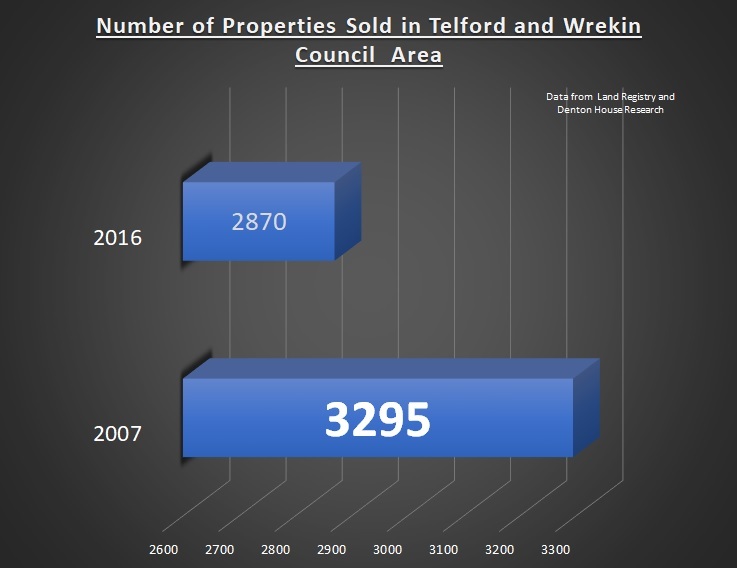 In 2007, 3,295 properties sold in the Telford and the Wrekin District Council area and last year, in 2016 only 2,870 properties sold – a drop of 12.90%. Therefore, we have just over 425 less households moving in the Telford and surrounding Council area each year. Now of that number, it is recognised throughout the property industry around fourth fifths of them are homeowners with a mortgage. That means there are around 349 mortgaged households a year (fourth fifths of the figure of 425) in the Telford and surrounding council area that would have moved 10 years ago, but won’t this year. There are around 125 households a year that aren’t moving due to a fall in the number of mortgaged owner occupiers (e. demographics). I then estimate another 49 households a year are of the older generation mortgaged owner occupiers. As they are increasingly getting older, older people don’t tend to move, regardless of what is happening to the property market (e. lifestyle). Then, I estimate 21 households of our Telford (and surrounding area) annual non-movers will mirror the rising number of high equity owner occupiers, who previously would have moved with a mortgage but now move as cash buyers (e. high house price growth). I believe there are 153 Telford (and surrounding area) mortgaged homeowners that are unable to move because of the financing of the new mortgage or keeping within the new rules of mortgage affordability that came into play in 2014 (e. mortgage). The first three above are beyond the Government or Bank of England control. However could there be some influence exerted to help the non-movers because of financing the new mortgage and keeping within the new rules of mortgage affordability? If Telford property values were lower, this would decrease the size of each step up the property ladder. This would mean the opportunity cost of increasing their mortgage would reduce (i.e. opportunity cost = the step up in their mortgage payments between their existing and future new mortgage) and they would be able to move to more upmarket properties. Then there is the mortgage rules, but before we all start demanding a relaxation in lending criteria for the banks, do we want to return to free and easy mortgages 125% Northern Rock footloose and fancy-free mortgage lending that seemed to be available in the mid 2000’s … available at a drop of hat? We all know what happened with Northern Rock …. Your thoughts would be welcome on this topic. For more blogs about the Telford Property Market please visit our blog.